Welcome! Wonderfully fresh, vibrant squash yellow petals from the calendula plant. Magical herb with very distinct uses; to win in court, connect with the fae, to draw prosperity, and to bring prophetic dream about lucky numbers! I don't know about you but I can't wait to try it! Simply steep and make a tea and enjoy the divine benefits of this herb! Completely safe to use internally and externally. Used medicinally to heal wounds, increase blood flow and heal ulcers both internal and external. Try it out! You will find NO fresher herb...other than picking it yourself of course;) While I firmly believe in supporting local business, you just don't know how long herbs have been sitting on the shelves in stores. My herbs are as fresh as they come! Viable, potent, and full of healing and magickal energy! The color and scent will prove it! Ashe! 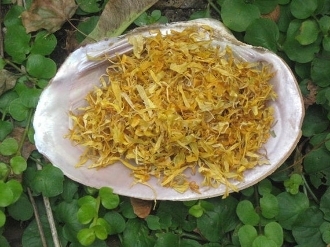 To receive the sight of the fae, make a mild infusion of calendula petals, let cool, then soak cotton pads in it and place them over your eyes. Messages are to follow. 4x3 inch zip bag for freshness and convenient storage. Thanks for looking!